Weddings call for style that is sober and classy. Whether your aim is to charm someone at a wedding or simply not to cringe when you look at the wedding pictures later- it is imperative to be immaculately dressed for weddings. Yes, there’s pressure to look good. But do not worry. We have compiled a guide filled with useful tips to keep your wedding style soaring this summer! So, dive in! Now, let’s delve a little deeper into these wedding essentials. The best way to blend with the summer wedding mood is by donning pastel hues. Simple, soothing and elegant, pastel shades perfectly embody the summer spirit. They are definitely the favored color-palette this season and outfits in chalky colors are a great addition to your summer wardrobe if you want to look colorful, but in a subtle manner. The best part about these soft colors is that they compliment all skin tones! You can experiment with different combinations of pastels. For a particularly striking appearance, wear two complimentary pastel shades together, like mint green and pastel beige. 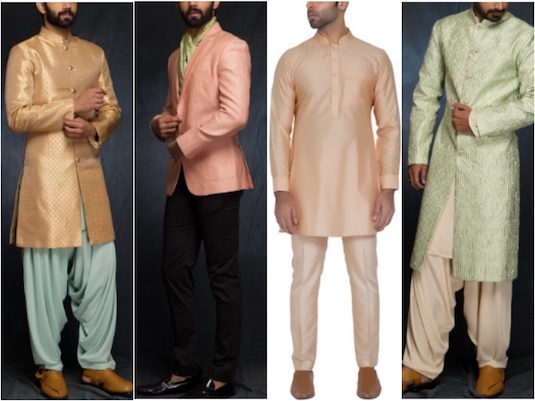 For a bold style statement, pair an eye-catching pastel shade with neutral colored bottoms, like a pink sherwani over black denims. If traditional Indian outfits don’t define your style, then crisp linen shirts are your go-to clothing for summer weddings. Light, comfy and practical, this fabric is perfectly synonymous with summer-style. Not only are they the most weather-apt attire, they exude boundless chic appeal. 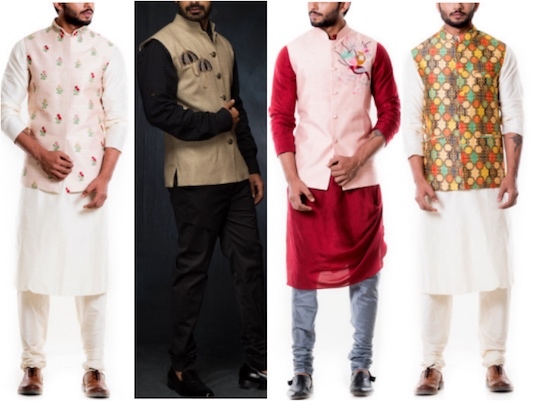 Bright linen clothing radiates positive vibes and is ideal for merging with the euphoric atmosphere of Indian weddings. When choosing a linen shirt for summer weddings, keep in mind that the brighter the color, the better the look! Did you know that a good quality linen shirt is lighter and more breathable than a cotton shirt? Moreover, linens are resilient to harsh summer sunlight; hence their colors don’t fade. Therefore, they are perfect for guests attending outdoor weddings during the day. 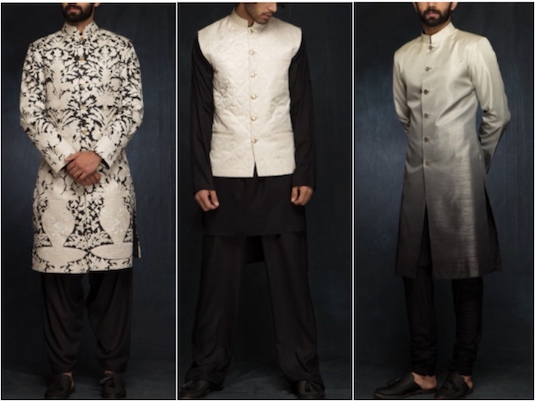 If vibrant embroidered motifs and colorful combinations don’t suit your macho style, then you must stick to classic monochromes, like black, blue and brown. Combining different versions of a single color can look absolutely fabulous. Choose a dark version of a color, like black, as a neutral that acts like a base for your entire look, and team it with a lighter version of that color, like grey. You can rest assured to not go wrong in this timeless style. Amidst the sea of colors normally seen in weddings, your monochrome attire will look striking and classy. Embroidery atop monochrome fabrics look unique and is very much in-style this season. The easiest way to update your wardrobe for the wedding season is by embracing colorful ethnic jackets featuring elaborate embroidery. Sleeveless ethnic jackets with quirky motifs and vibrant handiwork can glam up your ordinary kurta-pajama look. They add the much needed color pop to your ensembles and are all the rage this year! Every endeavor needs a perfect finishing touch, and custom made leather shoes for men do the trick. Informal footwear is a strict no-no for weddings. You need to don dress shoes and Fellmonger’s wide range of formal and casual shoes for men will definitely up your sartorial game! Dressed in eastern or western wear, you must dress your feet in good quality leather shoes. Brogues, like this cherry brown English brogue by Fellmonger, add a dapper touch to your wedding clothing collection. For a relaxed appeal, check out the sharp and sleek double monk elevator shoes. Created using plush leather and designed to perfection by skilled shoe-artists, our shoes guarantee unlimited class and style to their wearers.